Sea Palling beach01263 513811work BeachSea Palling is a small coastal village with a history going back to the Domesday Book. It has a wide sandy beach with a series of shallow bays formed by man-made offshore reefs created as part of a flood defence scheme. The coast line is designated an Area of Outstanding Natural Beauty. There is a pub, café, shops, amusement arcade and a stall selling locally-caught fish. •	There is a designated dog free zone area from May to September. This is clearly marked on the map which can be found on the Beach Information Board at the entrance to the beach. •	There are RNLI Lifeguards on the beach from May to September 10am to 6pm daily. •	First aid is available from the Lifeguards when operating. •	The modern public toilets are clearly signed and can be found at the bottom of the ramp on the left hand side. They offer showers, baby changing facilities and disabled toilets. 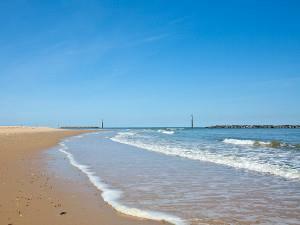 •	If you would like a BBQ party on the beach written permission from North Norfolk District Council is required. Sea Palling is a small coastal village with a history going back to the Domesday Book. It has a wide sandy beach with a series of shallow bays formed by man-made offshore reefs created as part of a flood defence scheme. The coast line is designated an Area of Outstanding Natural Beauty. There is a pub, café, shops, amusement arcade and a stall selling locally-caught fish.